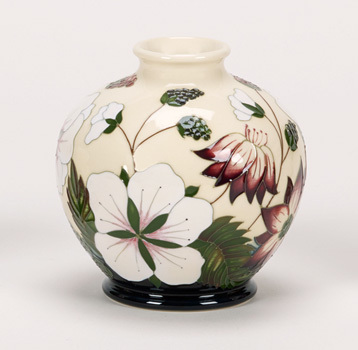 Moorcroft Bramble Revisited 41-4 Discounts Apply ! This design revisit an earlier Moorcroft piece and brings it up to date . This is a design has been a great addition to the range that Moorcroft offers. Comes in a presentation box and security for it's journey. We are Curiosity Corner. A special Bear Gift And Toy Shop in the heart of Historic Lavenham Suffolk. We have 2 Floors of Exciting Things To Explore and see including one of the Largest Collections of Teddy Bears for sale in the U K, including Steiff and Charlie bears and Merrythougt and many others. We carry many Trdational and Learning Toys and Games and Dolls all upstairs in their own medieval room with 14th century timber framed roof and wattle and daub walls and downstairs we have possibly the largest collection of Moorcroft Pottery and Jewellery, Handbags, Gifts For Ladies and Mens Gifts And all Sorts of Gift and Homewares .